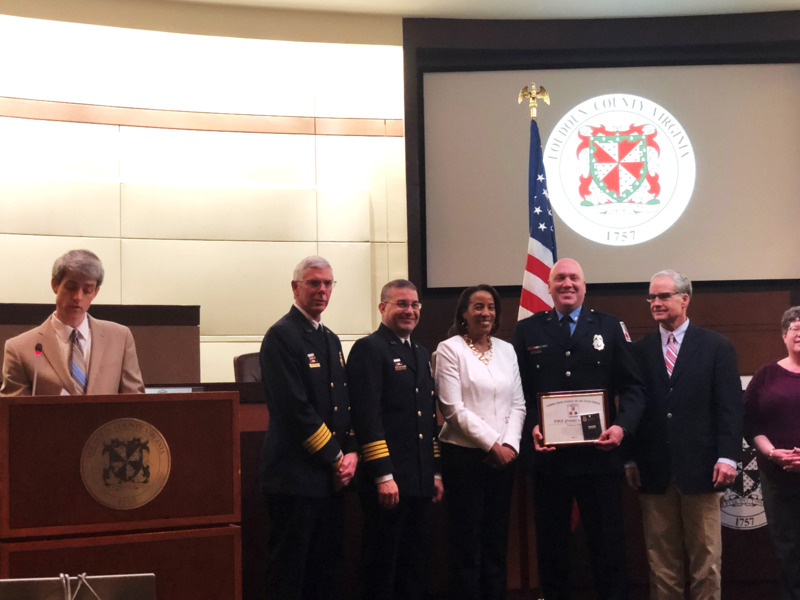 On Thursday, March 29th, the Loudoun County Combined Fire and Rescue System (LC-CFRS) held their Annual Awards and Recognition Ceremony to honor Loudoun's first responders, staff and citizens, who made dramatic contributions to the life and safety of our community. Nearly two hundred first responders, their families and friends packed the board room at the Loudoun County Government Center to celebrate the accolades of all 33 awardees. Assistant Chief Stevan Porter emceed the ceremony as Chair Phyllis Randall expressed her gratitude to all of the honorees. The awards and commendations were presented by Acting System Chief Keith Johnson, Assistant Chief Jim Cook, Rescue Chief Al Pacifico and Medical Director Dr. John Morgan. Also on hand to demonstrate their support and appreciation for Loudoun’s Fire and Rescue personnel were Supervisor Suzanne Volpe, Supervisor Geary Higgins and Supervisor Kristen Umstattd. The Clark J. Deener Memorial Award was presented to Firefighter/Paramedic Tracy Lane for her significant contribution to the development of our Emergency Medical Services (EMS) in Loudoun County. The Leo C. Kelly ALS Instructor Award was awarded to Lieutenant John Rice. This award, recognized Lieutenant Rice, an Advanced Life Support Instructor, for his dedication and commitment to Emergency Medical Services training. The Robert W. “Hap” Arnold BLS Instructor Award was presented to Training Officer Stephanie Corbin, a Basic Life Support Instructor, for her dedication and commitment to Emergency Medical Services training. Five individuals were presented with the "Hall of Fame Award" for their many years of service and outstanding contributions furthering the advancement of Fire and EMS services in Loudoun County. Hall of Fame Awardees include Retiring System Chief W. Keith Brower, Jr., past Rescue Chief Linda Curtis, Deputy Chief Linda Hale, past Chief James Kiser and Deputy Chief Jose Salazar. The John C. Carr, Jr. Memorial Award was presented to Chief Bob Dryden and Retiring System Chief W. Keith Brower, Jr. and recognizes their outstanding leadership and achievements during their service within the Loudoun County Combined Fire and Rescue System. The Fire Instructor of the Year Award was presented to Lieutenant Boyd Morris and Lieutenant Brent Smith, both Fire Instructors, for their dedication and commitment in fire suppression training for the Loudoun County Combined Fire and Rescue System. The Meritorious Service Award recognizes a member or members of the LC-CFRS for conspicuous gallantry and bravery at the risk of life, above and beyond the call of duty that directly resulted in saving a life. Paramedic/Firefighter Alexander Apple, Ms. Elizabeth Apple, Emergency Medical Technician (EMT) Jessica Lindsay, Lieutenant Christopher Jenkins, Firefighter/EMT Clarence Kidwell, Firefighter Connor Wright and Lieutenant Jacob Sherer were bestowed with this award as a result of their life-saving actions on an emergency incident. The System Recognition Award was presented to the McCarthy family (Tom, Sarah, Caleb and Meara McCarthy) were recognized for their heroic actions that directly contributed to a positive outcome on an LC-CFRS incident. The McCarthy family, heroically and selflessly, came to the aid of a fellow Loudoun County resident as he was experiencing a life threatening emergency. The System Chief’s Commendation was presented to Lieutenant Greg Southwick for his contributions or actions to promote and enhance the efforts of the Fire and Rescue System. Lieutenant Southwick demonstrated incredible leadership, decorum and support to many System personnel during the tragic loss of a LC-CFRS member last December. The EMS Provider of the Year Award was presented to Lieutenant Jessie Nelson and Firefighter/Paramedic Donald Vick whom demonstrated outstanding performance and dedication in their duties, exemplifying the highest traditions of the Fire and Rescue System. The Firefighter of the Year Award was presented to Firefighter Karam Mashaal and Firefighter/EMT John "Wes" Howard whom demonstrated outstanding performance and dedication in their duties, exemplifying the highest traditions of the Fire and Rescue System. The Civilian of The Year Award was presented to Chaplain John Boyle and Fire and Rescue Planner Maria Figueroa Taylor, both non-operational and administrative members of the System, whom demonstrated outstanding performance and dedication in their duties, exemplifying the highest traditions of the Fire and Rescue System. The Officer of the Year Award was presented to Assistant Chief Scott Maple and Lieutenant Christopher Kordek whom demonstrated outstanding performance and dedication in their duties, exemplifying the highest traditions of the Fire and Rescue System. The Recruitment and Retention Award, previously known as the Leadership Award, was presented to Ms. Abena Bonso-Bruce for her leadership and contributions whose impact greatly influenced newer members of the System. Pictured (from left): Medical Director Dr. John Morgan, Acting System Chief Keith Johnson, Assistant Chief Matthew Tobia, Chair Phyllis Randall, Firefighter/Paramedic Donald Vick, Supervisor Geary Higgins.